No need for configuring or fiddling with screen resolutions. ClickShare will intuitively detect and adjust to the optimal settings for your system. The ClickShare hub of your choice (Mobile or Classic) is all that’s needed. Then simply launch your presentation or share content with a single click. Users connect to the ClickShare USB device or via a mobile app (iOS or Android), and they can stay on their own corporate WiFi. 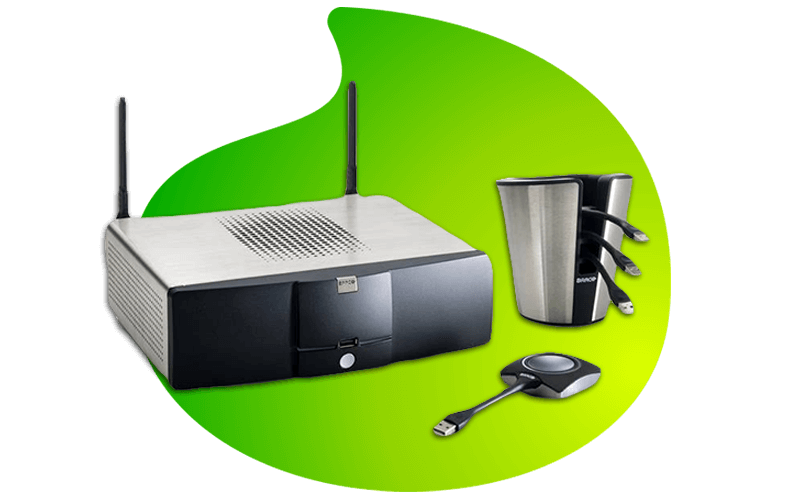 ClickShare Classic is designed for high profile meetings and conferences, with up to four devices on screen simultaneously, and up to 64 connections to the base station. Can I use my mobile to share content? Yes. Both Android and iOS applications are available. Can it work with VC? Yes, if your video conferencing system supports a data channel. In that case, you can use the output of the base unit as input for the data port of the Codec. How does it work when a fifth person wants to connect when there are four sources on the screen? When a fifth person pushes the dongle button, a message will appear on the laptop/MacBook of this user informing him or her that the central screen is full. However, the “Show me only” feature still works. When the fifth person holds the button for more than 1.5 seconds, the other sources are removed and the 5th source is shown full screen. Do you install anything on my PC? No. ClickShare is a zero footprint solution. After plugging out the dongle, no trace is left on your PC.